I am still thinking about kids going back to school this week. :) I am sure all of you with school age kids have been busy getting their school supplies and fighting the people and checkout lanes of the big box stores. That is always sooooooooooo stressful. Why not take a little stress off and make something for your kids school supplies. Since it has been awhile I am not up to par with what kids have on their school supply list, but if pencil bags are still there here is a great tutorial on how to make one. 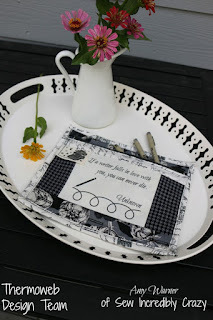 I saw this tutorial from Thermoweb.com that Amy Warner wrote for their blog on making a pencil bag with photo transfer sheets. So if your kiddo needs a new pencil bag why not try this one.